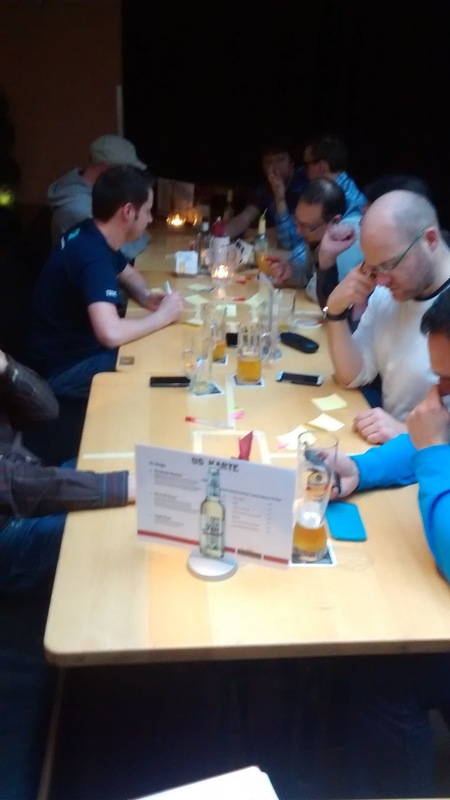 Let's begin with old news: In November we talked about the future of the Bonn Agile meetup. As most of the organizers stem from a background in software development, we are planning to shift the focus more into the technological domain. For those primarily interested in methodology like Scrum, there is an interesting new meetup in Bonn, Scrumtisch Bonn. 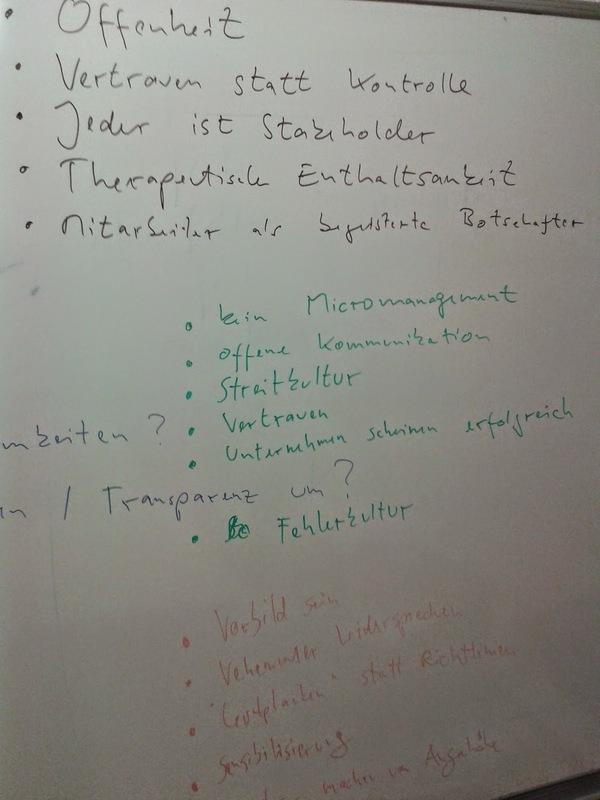 We also decided to try a different format for our next meetup: Instead of having a single, longer talk which demands a significant amount of preparation, we wanted to try two shorter talks, which require less preparation and leave more space for a dialogue between the participants. 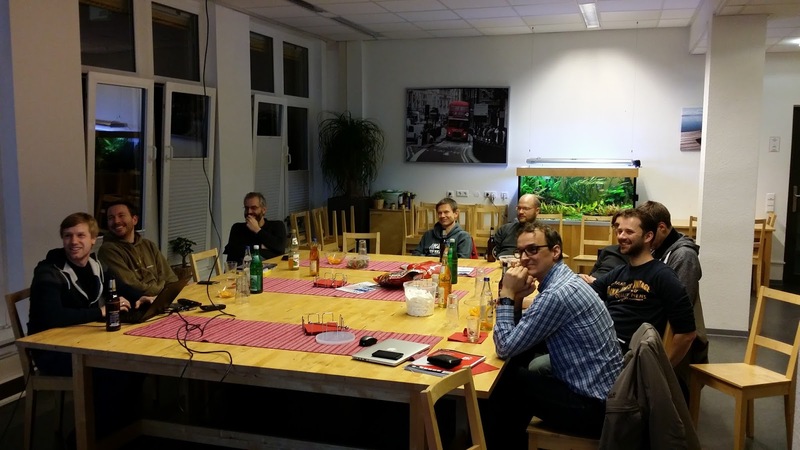 So the December meetup featured two tech topics, Apache Kafka presented by Andreas Kluth, and the Go Programming Language by Sebastian Mancke. The meetup was once again hosted by the generous folks at Tarent Solutions. Andreas talked about using Kafka as a means to allow communication between services in a "shared-nothing" microservice architecture. As Kafka is a really light-weight pub-sub-messaging system, it is optimized for performance and throughput. The buzzword "Big Data" is really overused these days, but that's where Kafka has it's strengths, especially as it allows clustering of instances, which makes it perfectly scalable. Feel free to check out Andreas' slides. In an interesting live coding demo, Andreas also built a scenario with Kafka, Zookeeper for clustering, and a producer and consumer of messages. This was a great opportunity for the audience to chime in and share their ideas and perspective, and evolved into an interesting dialogue. After a short break, Sebastian took over and talked about the Go programming language. It is gaining a significant momentum, Google is pushing Go usage in Android apps, which used to be an almost exclusive Java domain. Although Sebastian has not used Go in a major project, he is optimistic that there will be more demand in Go in the near future. As you can see in Sebastian's notes, the syntax of Go is both simple and expressive. It also introduces some interesting concepts like channels, which makes it easier to deal with concurrency. Sebastian described Go as easy to learn, he was able to become fluent in a few weeks and told us he gets things done faster in Go than in Java, although he is an advanced Java programmer. Sebastian also did some live coding, which again proved as a great means to get the dialogue going and ask more in-depth questions. After a well-deserved round of applause for the speakers, we had a few beers and ended the evening with some more tech banter. As always, it was great to meet up, have fun and learn something new. The next meetup will be in February 2016, please follow us on Twitter where we will announce the exact date. Have a great Christmas break and a happy New Year! 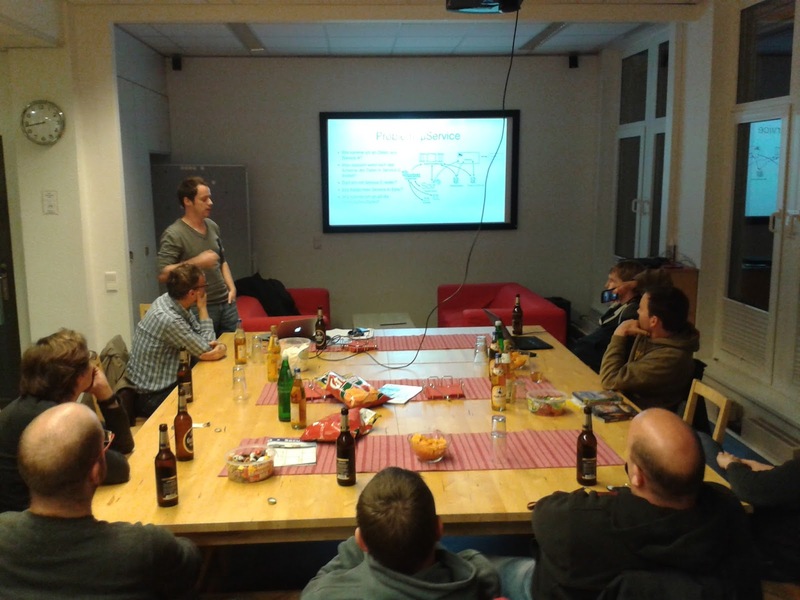 We had a big crowd attending Andreas' talk about User Story Mapping in June. You can find some pictures and links from the events via the Google+ event page. Thanks to Data-in-Transit for hosting us in their brand new lovely offices! In June we had a smaller meetup, but still a full coding dojo of a group doing mob-driven development. It was a lot of fun, so we forgot to take pictures! But you can find some links of what we were doing in the mailing list thread (German). 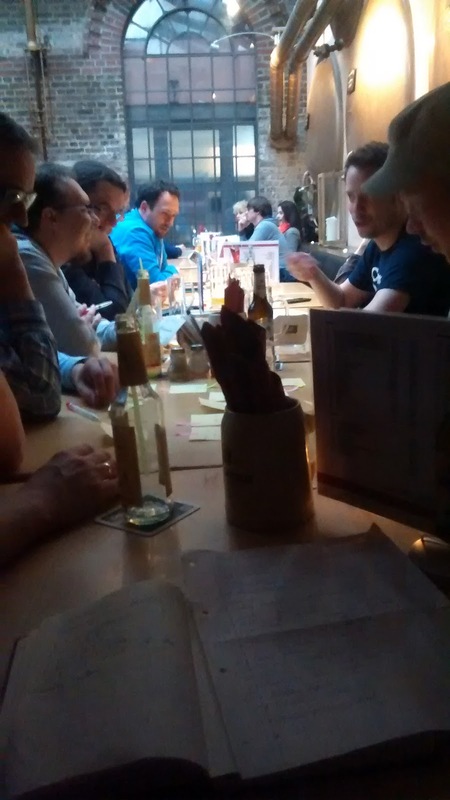 The upcoming meetup will be a beer-garden meetup, if the sun keeps shining. It's now on Tuesday, and you can find out more on the Xing event. For our last meetup, I suggested we take a closer look at the Cynefin Framework. Perhaps you've heard about it, or maybe not, but this seems to be one of the big up and coming terms in the agile world, and it is also present in other communities as well (project management, DevOps, etc). If you want to learn more about what the framework is, have a look at the resources below (and the resources they again link to). For this post, it suffices to say that the creator of the framework Dave Snowden, and I think it is a very generic, perspective/world-view framework, rather than one that tells you what do exactly. http://yi-tan.com/wagn/Navigating_Complexity - Podcast episode, interview with Snowden with some deep discussion. https://hbr.org/2007/11/a-leaders-framework-for-decision-making - Very good article that perhaps spawned a lot of the interest around Cynefin there is today. https://www.youtube.com/user/CognitiveEdge/featured - Various videos introducing Cynefin. http://theagilerevolution.com/2012/06/05/episode-33-cynefin/ - Podcast episode, light introduction. http://lizkeogh.com/2012/03/11/cynefin-for-devs/ - (Also see her other related posts). So, after having heard through some of the podcast episodes many times (I needed to hear through them repeatedly before I started to grok the discussion), I put together an adaptation of a workshop I found described the webpages of Cognitive Edge, which is Snowden's company. You can sign up for free there to get at some of the resources. Unfortunately, they re-implemented their website right after the meetup took place, and now I can't log in there for some reason. We split into 3 tables, each of which were going to roleplay being the managers of a small company. I set some context for the company (what kind of employees, what they produce, etc), but left most up to the imagination of the participants. Each team of managers were instructed to discuss incoming "problems" they had to deal with, by placing them in the Cynefin framework's categories. The teams were told not to solve the problems, merely to place them in the Cynefin framework. After all the problems had been placed, we swapped around positions to hear how the other teams had categorized their own problems for some more discussion. There wasn't really any correct answers for any of these, but I found it really interesting, and I guess that is one of the key goals of Cynefin, how the managers had to separate complicated problems from complex ones. It was also interesting to see how trying to see the problems from the various perspectives, different solutions would pop into my head. The minus about using this fictional company, instead of using it in a real company, internally, is that the context was somewhat artificial. I hope nonetheless that we got some valuable practice in how to make use of the framework when we go back to our day-jobs. I certainly have started seeing more things now in light of the Cynefin perspective, not so much in my job, but more when I look at why large companies and governments are having problems with their massive IT projects. I also see the same trend in education. It seems society as a whole is trying way to much to treat things as if they were in the complicated domain, when actually they should be dealt with as complex issues. The other key learning for me was that an agile process like Scrum, operates by iterating on features moving us from complex into more ordered systems (by implementing "constraining" software). But sometimes, we actually want to shake things up a little, and move existing systems out of the ordered space, to see what things can be improved upon, and we don't really have a technique for that in our agile methods. All in all, I think Cynefin is a fresh breath of air into the agile community, which has been pretty stagnant the last years. Perhaps we could need a bit of chaos and complexity in our methods. I also hope that we can get some more knowledgeable Cynefin coach to visit us some time, and give us a proper talk/workshop on the subject. If you know one, or if you are one, let me know! 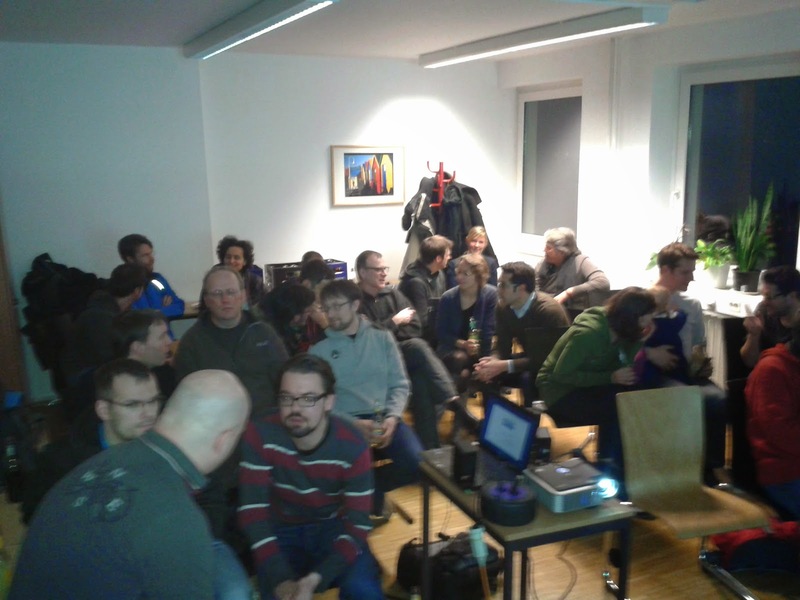 The first meetup 2015, and already a full house! We met at the Bildungswerk für Friedensarbeit in Bonn to discuss "new work", as depicted in the film "Augenhöhe", which portrays several companies that are based on core values like democracy, transparency and respect. We were lucky to have a great special guest, Fabian Dittberner, of it-agile, a company with a focus on agile consultancy, which already incorporates a lot of the values that come with the new work movement (Read more about it-agile in the September 2014 issue of Brand Eins). Fabian gave us a valuable first hand insight into the inner workings of it-agile, and whet our appetite for the Augenhöhe film. The 45-minute film, which can now be streamed at Vimeo, gave us a great context for an hour and a half of dialogue, which was held in a "World Cafe" style. This proved to be both interesting and entertaining, and we gained lots of insights into the status quo and opportunities for improvement. Afterwards we headed to Bierhaus Machold, where dialogue continued over a glass of beer. It was a great evening! "Ich fand die Veranstaltung gestern sehr nett, ich war bestimmt nicht das letzte Mal dabei!" "Es hat mich ebenfalls sehr gefreut! Ich hoffe, ich schaffe es mal öfters zu euch nach Bonn." "Vielen, vielen Dank für die Einladung. [...] Ihr ward alle so nett und an diesem Tag habt Ihr mir einfach sehr gut getan :) - DANKE!" "Danke für einen spannenden Abend auf Augenhoehe!" intrinsify.me and the makers of "Augenhöhe"